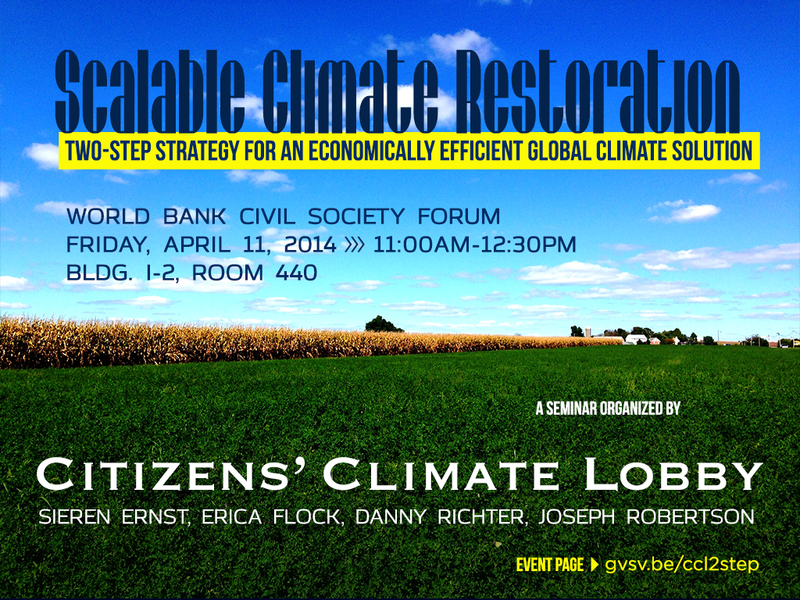 Friday, April 11, 2014: Today, at 11:00 am, we presented our second policy session at the World Bank Civil Society Forum. The session was an intimate seminar discussion designed to introduce a draft whitepaper outlining a 2-step global climate solution. We focused on implementing a carbon price first, to transform national and regional energy economies, then on creating a more effective (due to carbon pricing) mechanism for funding needed climate response and deployment of new technologies. The group gathered close around the table and seemed to be characterized by real and incisive intellectual curiosity. We had a great group of participants who paid attention and asked useful and illustrative questions. While we waited for stragglers to find the room (the only room on the second floor beginning with a 4), we got to know each other. We had engineers, artists, entrepreneurs and economic analysts. Everyone seemed to express interest in bringing a certain amount of creative intuition to expanding the space for constructive solutions. As Citizens Climate Lobby, and with the specific focus of engaging citizens in improving the quality and inclusiveness of work we do, as a global community, we started with a focus on local impacts and ways to transmit stakeholders’ voices. During a week of Civil Society dialogues, the need to find ways to involve stakeholders and to get a clear picture of life at the human scale took center stage in detailed policy discussions. Partly due to the quality of our audience, and partly due to the substance of the fee and dividend plan, the discussion was rich, open and robust. The panel helped to illustrate how a revenue-neutral carbon tax, with revenue return to households, can build first-level resiliency: a measure of quality of resource availability at the human scale. Erica Flock, Online Manager for EarthShare and Citizens Climate Lobby’s co-leader in Washington, DC, explained the process of research and reporting that went into creating her Climate Impacts cork board on Pinterest. 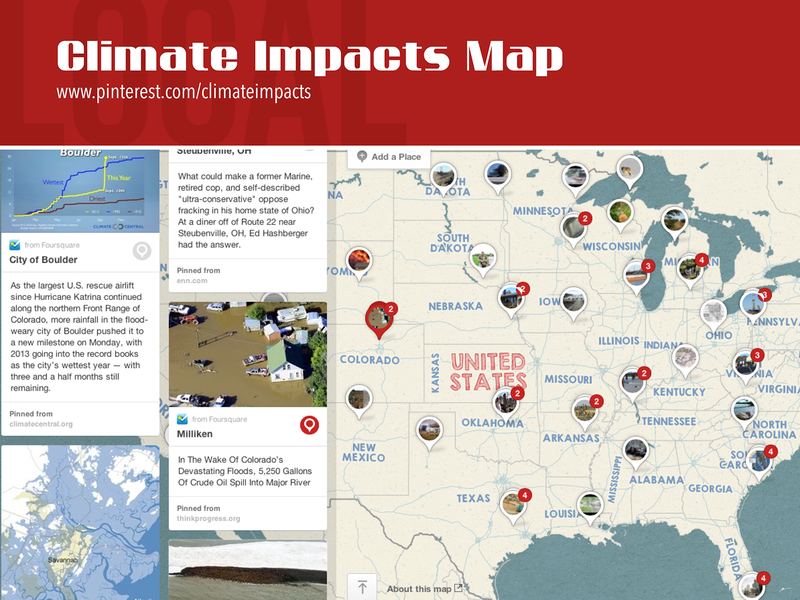 The project details impacts from climate change in all 50 of the United States. Erica’s Climate Impacts cork board is important for a number of reasons, but at the World Bank, its most salient value is that it helps to show that fossil fuel externalities are real-world costs lived by real people and that we can actually learn about them in ways that might be cost-effective, scalable and reliable. Erica reminded our audience that evangelical Christian climate scientist and CCL advisory board member Katharine Hayhoe has said “the facts are not enough”. There has to be a clear ability to connect global scientific fact with local impacts and the human ethical story. Erica’s project shows important and unprecedented changes happening locally, across all 50 of the United States and provides a working model for worldwide stakeholder-driven local reporting of climate-related impacts on human society. Danny Richter, PhD, CCL’s Legislative and Science Director, took attendees through a tour of the legislative and economic logic of a carbon fee and dividend plan. Carbon fee and dividend, as proposed by Citizens Climate Lobby, is entirely revenue neutral, as 100% of revenues are returned directly to households. No funds are appropriated by Congress. The fee and dividend plan is simple, applied to only a few thousand entities, even in a market as big as the United States, and easy to enforce. It can be applied by governments across the world, in order to deploy effective carbon pricing that doesn’t require added public spending. Crucial to understanding how this plan works is the fact that incentive drives changes. A structural change in the economic landscape alters the calculation of what specific actions have value of what kind. The financial sector’s calculus about which choices are the smartest changes, as does the questions asked by local governments as they plan to implement new rules relating to energy use, building codes and support for innovative local businesses and low-carbon transport and other service providers. Sieren Ernst, principal at Ethics and Environment and co-leader for CCL in Washington, DC, discussed the efficiencies and complications of a border adjustment policy. A border adjustment can be made simple, straightforward, and effective, if designed only to level the playing field and built around agreed-upon carbon-emissions potential for specific resources. But the most important detail of this piece of the carbon pricing puzzle is that any nation that is planning intelligently will not have the problem of paying border adjustments to other nations, because it will adopt a carbon pricing model that makes the adjustment unnecessary. This point invites a lot of complex analysis, but the discussion centered on three key points: 1) is the border adjustment feasible? 2) will it lead to changes in trade flows? 3) will it effectively propagate carbon pricing and end up not being administered as an actual border tax? 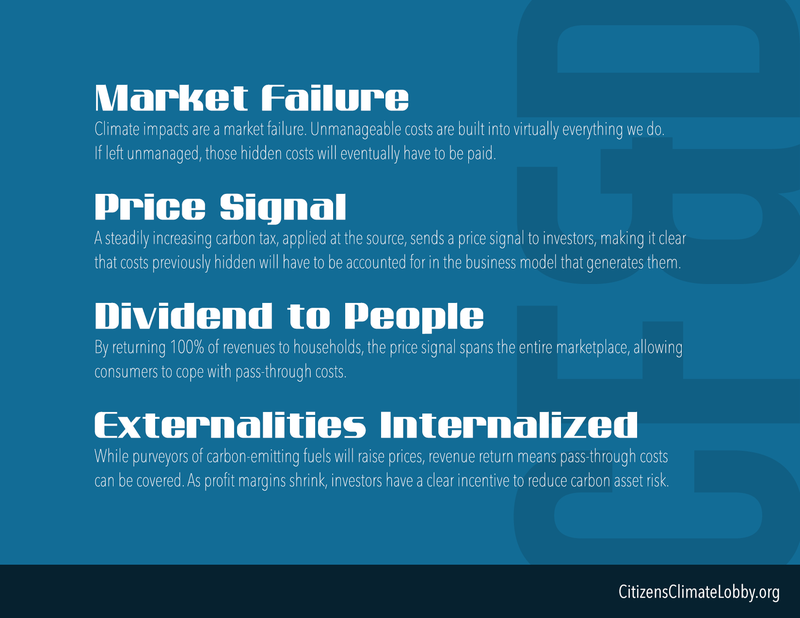 The complication fades to the background, at least in this discussion, as it becomes evident that 1) yes, it is feasible, from a policy standpoint; 2) it can reward countries that innovate; 3) it will most likely not be paid, as implementing a smart market signal for the price of carbon is a wiser choice all around. While this part of the policy discussion is potentially the most sophisticated and entangling, it also provides another point of entry for citizen engagement; across the world, honorable service to constituents, transparency in negotiations and meeting the demand for sustainable investment practices, will allow the voices of stakeholders to line up with this simple lever that can allow for a more level (and more livable) economic playing field. One of the great sticking points of global climate negotiations is climate justice. The biggest polluters have had not just decades, but centuries to emit greenhouse gases to drive their industrial revolution, while some of the most vulnerable and least affluent nations have contributed relatively little to the total historical volume of industrial carbon pollution. This gives rise to the demand for compensation for the emissions they will be forced to forego and restitution for the fallout from unchecked past emissions. With a fee and dividend plan, the revenues are returned to households, but they cannot be disbursed across the planet, for two reasons: 1) the revenue return is the mechanism that internalizes costs to industry and investors and drives the transition to clean renewables; 2) if the revenues are distributed to other markets, with different emissions profiles, the leverage will be less, the fix will take much longer, and the recipient markets will continue to see unaffordable climate fallout. 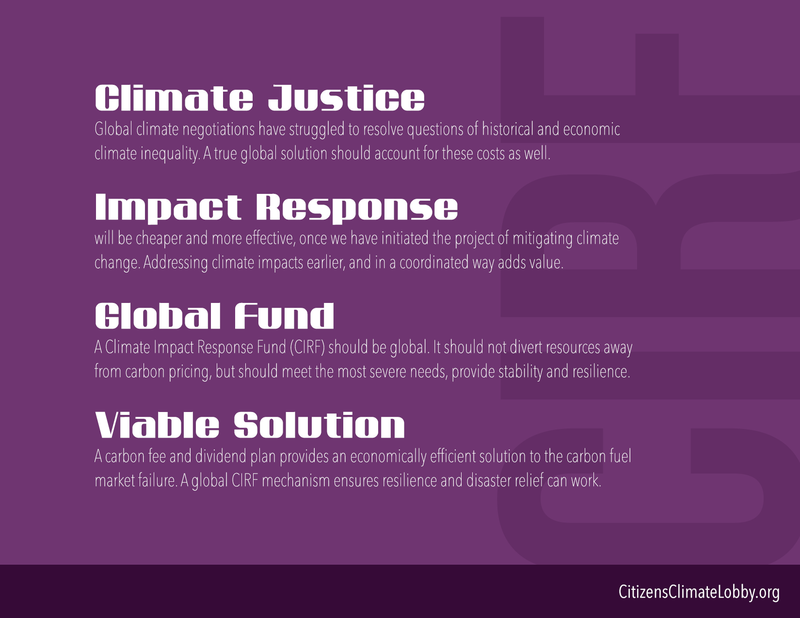 So, a Climate Impact Response Fund (CIRF) should be set up separately. Multilateral institutions know how to create and manage global donor funds, two different funds already exist which might serve this purpose, and we know from the work of RESULTS volunteers on funding for the Global Fund for AIDS, Tuberculosis and Malaria, that morally founded advocacy can win major support for the necessary global funding mechanism. The session was a gathering point, a conversation around a watering hole, an effort to pin down certain descriptions of the landscape (natural, built, political), and a way to hash out differences through a fluid, non-linear question and answer. It was a moderated tour of the policy environment and a clear indication that people not only predicate and experience impacts, but people also are meaningful witnesses to their own experience. The final whitepaper will be available this June, including full source listing and annotations. It will be presented to the G20Y Summit Energy Committee as recommended reading, and Citizens Climate Lobby will again discuss some of the dynamics of this strategy at the World Bank Fall Meetings Civil Society Forum, and will take this plan to Lima, in December. To do this work is a privilege, and this week at the Civil Society Forum is a powerful reminder that being present to be have a voice in the discussion is crucial to making good things happen. This week, I had a long and detailed look at the question of involving citizens in decision-making processes at multilateral institutions; whatever the challenges, the benefits seem worth the effort. 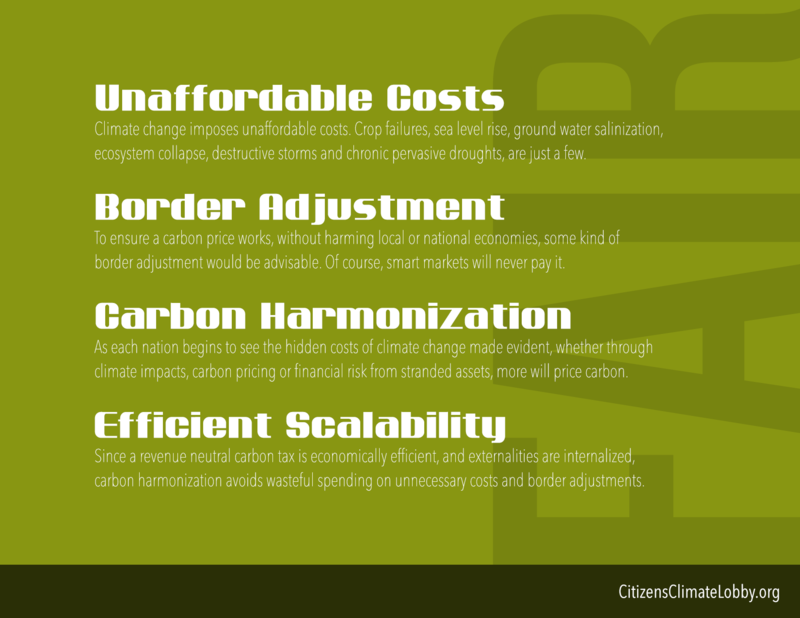 CCL’s Fall 2013 presentation to the World Bank Civil Society Forum—Stakeholder-Centered Carbon Pricing.